Associate Professor at the Department of Mathematics, Faculty of Science, King Abdulaziz University, Jeddah from August 2, 2016 - Till date. Senior Assistant Professor at the Department of Mathematics, Faculty of Science -Rabigh, King Abdulaziz University, Jeddah from December 01, 2014 to August 1, 2016. Senior Assistant Professor at the Department of Mathematics, Aligarh Muslim University, from February 8, 2008 to November 30, 2014. 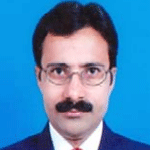 Assistant Professor at the Department of Mathematics, Aligarh Muslim University, from July 24, 2006 to February 7, 2008. Lecturer(as Guest Faculty) at the Department of Mathematics, Aligarh Muslim University, from September 7, 2005 to May 2006. Lecturer at the Department of Mathematics, Aligarh Muslim University, from August 7, 2004 to July 15, 2005. Research Associate(Post Doc Fellow) at the Department of Mathematics, Aligarh Muslim University, from January 25, 2003 to August 6, 2004. Ph. D. (Mathematics) from Aligarh Muslim University, Aligarh in the year 2002. Topic of Ph. D. Thesis: “ Study of Derivations and Commutativity of Rings”. M. Phil. (Mathematics) from Aligarh Muslim University, Aligarh in the year 1999. Topic of M. Phil. Dissertation: “A Study of Derivations in Associative Rings”. M. Sc. (Mathematics) from Aligarh Muslim University, Aligarh in the year 1996 with first division. B. Sc. (Hon’s) (Mathematics, Physics & Chemistry) from Aligarh Muslim University, Aligarh in the year 1993 with first division. Certificate course in “C++‘’ Programming, from Tata InfoTech Training Facility Computer Center, Aligarh Muslim University, Aligarh in the year 2003. GATE (Mathematics) conduct by Indian Institute of Technology(IIT), Kanpur in the year 2001 with All India Rank-93.